Not your typical inland freshwater dive site! Seaweed Diver offers monthly dives in June, July, August and September of each year. Check our online calendar or watch our Facebook page for details. Our schedule includes an opportunity for training dives on Friday afternoon, all day on Saturday and about 1/2 day on Sunday. Mermet Springs is a full service dive site and scuba center. They strive for excellence and cater to dive shops, instructors, students and certified scuba divers of all experience levels and certifying agencies. This is one of Seaweed Diver's favorite local spots and we plan monthly dives throughout the summer. Owner Glen Faith knew what he wanted in a dive site long before his first training platform was submerged. He assembled a team of top quality dive professionals and turned his dreams into a reality. Mermet Springs offers submerged training platforms, easy entry docks, dives from 15 to 120 feet in depth and numerous sunken treasures to explore. Mermet Springs is one of the most popular dive facilities in the midwest, attracting the attention of news media and national scuba diving publications including National Geographic and other diving publications. Mermet Springs is an 8.5 acre spring-fed quarry located deep in Southern Illinois. The water visibility at Mermet Springs is exceptional and can range from 15 feet to over 60 feet. Water temperature varies with the Midwest seasons and ranges to the low 40s at depth during winter, and to the mid 80s above the thermocline in the summer. Mermet Springs was founded by Glen Faith who discovered this abandoned quarry lake early in his days as a recreational diver. Seeing the potential of the property he made his move by signing a long term lease with the owner and removing tons of scrap and junk from the quarry. Early on, Glen designed the drainage around the 8.5-acre lake to slope away from the water. By doing this the lake remains clean and clear with only rain and spring water feeding the lake. Over the years, Glen has continued to update the site with campgrounds facilities, training pavilions and numerous underwater attractions. All revenue generated by Mermet Springs is immediately reinvested into the facility. By doing this, Glen has created a scuba diving facility offering divers an extraordinary opportunity not found anywhere in the Midwest. With crystal-clear water, 100-foot deep underwater cliffs, sunken wrecks and schools of colored, pre-historic looking fish, Mermet Springs is not just another lake in Southern Illinois…it is a "First-Class Diving" site. "One of the must see dives in the Midwest"
Mermet Springs is located on US 45 between Vienna and Metropolis, IL. As you enter the site, you'll be amazed at the picturesque wooded backdrop and sheer cliff rising across from the cool-blue water. From the main diving dock, you'll see schools of large bluegill, giant albino channel catfish and further down Spoonbills! These prehistoric throw-backs have huge mouths and are known to grow larger than five-foot in length. Seeing these "paddlefish" up close will raise your pulse a bit, but don't worry…they are filter feeders and eat miscrospic critters that feed on the algae. All these fish are very friendly, almost tame. Fishing is strictly prohibited at Mermet Springs. But feeding the fish is welcome, just watch your fingers with those big cats. In general we arrive at 3:00 pm Friday to get ready for diving. Saturday and Sunday we begin at 8:00 am and dive throughout the day. Students and certified divers are always welcome. If you don't have a buddy, we will help you get matched up. 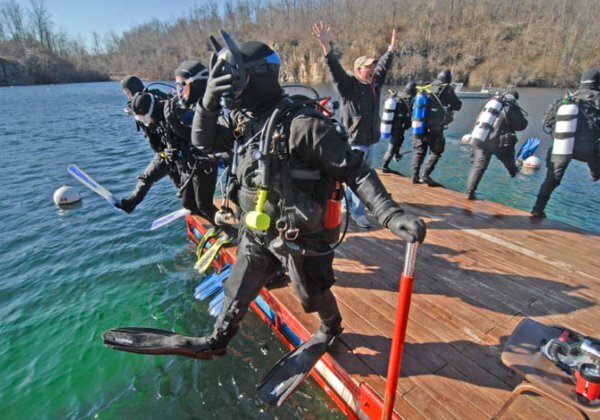 We do training dives for all levels of divers; Open Water through Instructor. Just let us know what you want to get accomplised and our staff will do our best to make it happen. Want to know what to expect? Check out the water temperatures on the Mermet Springs Home Page.